Credit Unions are not-for-profit financial institutions dedicated to serving the financial needs of their member/owners. When you open a Share Account in a credit union you become a member/owner, and each credit union member has equal ownership and one vote. Members annually elect the Board of Directors, volunteers from the membership who work along with the credit union staff to conduct the business of the credit union. Credit Union members must share a common bond: At 1st Community Credit Union our members live or work within our 5-county field of membership or they are related to a 1st CCU member. Credit Unions typically offer higher rates on savings, fewer fees, and lower rates on loans. More Wisconsinites than ever - 3 million to be exact - are turning to Wisconsin's credit unions to be their financial partner. Since the first credit union was chartered in Wisconsin more than 100 years ago, credit unions have been an essential component of Wisconsin's local economies - providing REAL Solutions to the problems faced by members and the communities those members live and work in. While not mandated to do so, credit unions offer REAL Solutions because being member-owned allows them to put member needs first and go where other financial institutions can't or won't. That makes credit unions different: They put people before profit and provide solutions that benefit members, nearby schools, small businesses and community organizations. We're proud of what we've accomplished and we're proud to be home to the Movement's international and national trade associations, mutual insurer, national charitable foundation and independent think tank. Whether it's facing the financial challenges of today or planning for tomorrow, credit unions will continue to evolve to meet the needs of their members and support Wisconsin's working families and communities. 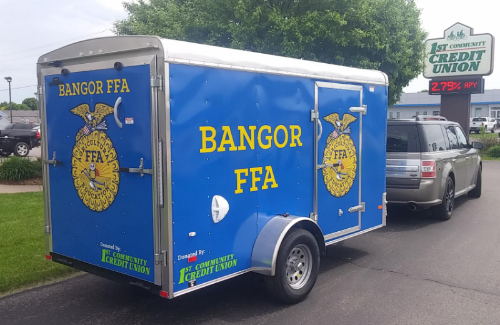 1st CCU donated a utility trailer, complete with full signage, to the Bangor High School FFA Chapter. The trailer is being used in many ways, including tool storage at the community garden in West Salem, transportation of tools and equipment for the Food for America event each Spring, hauling materials to various FFA conferences and student fair projects in July. 1st Community Credit Union made a $10,000 donation towards the new the West Salem Boys and Girls Club facility at West Salem Middle School. Pictured L-R, Chris Krueger, 1st CCU WS Branch Manager, Eric Hesselberg, 1st CCU Board Chairman, Don & Cheryl Brenengen, Campaign Co-Chairs, Britton Slowey BGC Site Director and Mike Desmond Senior Director of Development with the Boys & Girls Club. The facility that is used for the Boys & Girls Club of Sparta's annual "House of Shadows" needed some repair recently. 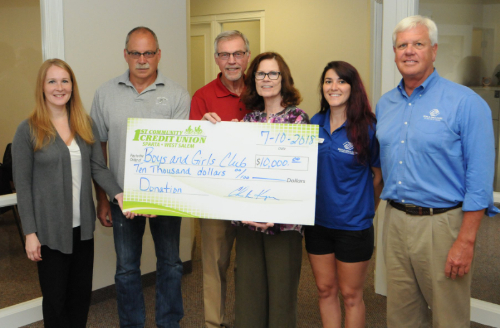 1st Community Credit Union stepped in with a $5,000 donation to cover the costs. 2018 is the 20th anniversary of the "House of Shadows", which is a major fundraiser for the club. 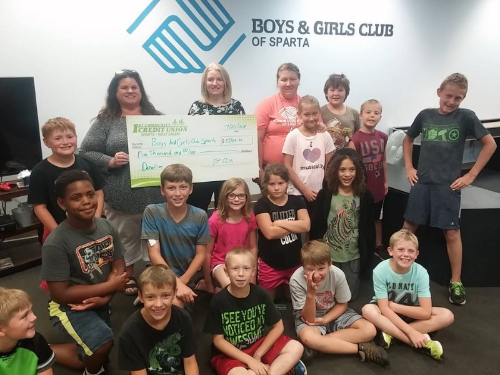 Pictured holding the check are Jennifer Simunich, BGC Executive Director, and 1st CCU, VP of Finance Wendy Swanson along with a great group of kids from the club. 1st Community Credit Union answered the call for the COW97 Coulee Region Strong Flood Relief Fundraiser by donating $2,000. 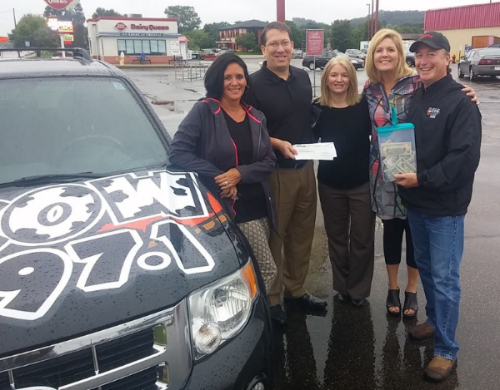 Pictured L-R Diana Mack, VP of Operations; Brad Bauges, President; Wendy Swanson, VP of Finance; Sandy Anderson, HR Director; and Willie Hoffman from COW97. Each year a few members of 1st CCU's staff volunteer at Sparta High School's Reality Day. 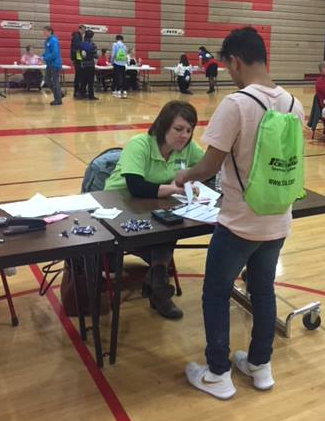 Pictured above is Molli Hundt, Mortgage Loan Officer, helping at the SOS table. The SOS table is where students get assistance with finding solutions to some very real-life scenarios.